Pare, core and slice apples; arrange in greased 1-qt. baking dish. Pour orange juice over apples. 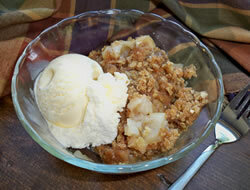 Combine 2 T. of the granulated sugar and cinnamon in a small bowl; sprinkle over apples. Combine flour, remaining granulated sugar and the brown sugar in same bowl; work in butter or margarine with fingertips until mixture is crumbly. Sprinkle evenly over top. 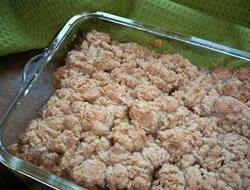 Bake in 375° oven for 25 minutes or until apples are tender and top is lightly browned. 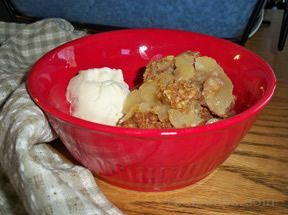 Serve warm or cold topped with ice cream.